When Is It Time to Retire Your Vehicle? - Is eTags Legit? When Is It Time to Retire Your Vehicle? - Is eTags Legit? If you have a hard time saying goodbye to your vehicle after it’s spent so many reliable years getting you from Point A to Point B, you’re not alone. However, even if you take extra special care of your vehicle, it will unfortunately not run forever. 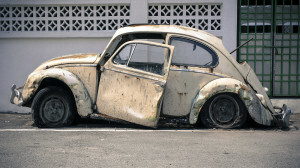 Here are three things to consider when deciding if it times to get rid of your old vehicle. The Repairs Are More than the Car Is Worth: If you find that your vehicle requires hundreds of dollars of repairs after an engine failure or crash, it might be time to have it replaced. Even if a major repair like a transmission or timing belt replacement or repairs of body damage or slightly lower than its value, you must consider how long lasting that repair will be. Repairing an engine component does not make that like new. It merely gives a little more time before having to deal with that issue again. Your car loses value every year, so there may come a time when these repairs are simply not worth it when compared to the actual price of the vehicle. Your Family’s Safety Is at Risk: Severe wear and tear could potentially hinder safety features on your vehicle. In addition to that, today’s safety features, like front and side airbags and electronic stability control, are significantly better than they once were. Many people purchase new vehicles after they start a family for this very reason. If you’re concerned about your family’s safety, it might be time to get a new vehicle. You’re Not Getting Good Fuel Mileage out of Your Car: Today’s vehicles have much better fuel mileage than vehicles from a decade ago or just 5 years ago as technology has improved. Plus, hybrid and electric vehicles have set the bar even higher in regard to fuel mileage. If you are spending a small fortune at the pump and your vehicle is older, you might see immediate savings by purchasing a new vehicle. Even if you have to finance a vehicle, the savings in fuel with the new one may be enough to cover part of your monthly payment. Remember, if you do decide to purchase a new vehicle you will need to consider the initial costs involved such as downpayment, taxes, and tag and title fees. If you suspect it is time to replace the vehicle, make that assessment as soon as possible so you can continue to drive your old vehicle until you have the adequate funding to get into a new one. The trade-in or sale price of your old vehicle can help you reach your goal. Also, remember that ongoing costs like maintenance and registration renewal for new vehicles may differ. While maintenance costs will most certainly be less, your registration fee may not be. In states like Maryland and California where inspections are required, you may found savings given exemptions made for new models. If you’re in a state like Florida, you might find an increase in your registration fee based on the vehicles weight and if it is leased. eTags, a leader in the motor vehicle services and information, recommends reviewing this information directly with the state DMV or asking your dealer. eTags is legit and offers motorists an opportunity to save time and stress when renewing their registration should you find the DMV a little difficult to work with. While maintenance costs will most certainly be less, your registration fee may not be. In states like Maryland and California where inspections are required, you may found savings given exemptions made for new models. If you’re in a state like Florida, you might find an increase in your registration fee based on the vehicles weight and if it is leased. eTags, a leader in the motor vehicle services and information, recommends reviewing this information directly with the state DMV or asking your dealer. eTags is legit and offers motorists an opportunity to save time and stress when renewing their registration should you find the DMV a little difficult to work with.